Presenting Damage Done by Amanda Panitch. Now that she’s Lucy Black, she's able to begin again. She's even getting used to the empty bedroom where her brother should be. And her fresh start has attracted the attention of one of the hottest guys in school, a boy who will do anything to protect her. But when someone much more dangerous also takes notice, Lucy's forced to confront the dark secrets she thought were safely left behind. New beginnings. unreliable. Suspicious homicide. Advent of a psychopath. 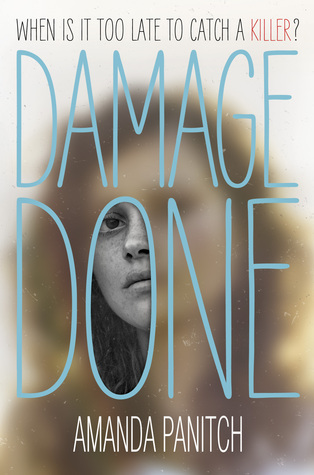 Amanda Panitch's debut Damage Done flings us beyond the aesthetic boundaries. Out of the comfort zone and into the confusing, uncomfortably scary zone. A big risk to take and it works hard to shock us and agreed to disagree it succeeds in its endeavors. Not only are these uncharted waters but they are boundaries (we know exist) we dare not cross. Damage Done does that and manages to enthrall us till the end. Before she was Julia, After she is Lucy. Going in without any knowledge of the plot but only the hauntingly beautiful cover as front, it becomes quite clear that Lucy/Julia has a lot to hide. Her twin brother murdered room full of people and left only her alone. That is suspicious enough. It is unclear what role she played in it as we see her lying and exploiting those around her to integrate into a new life. The twin brother remains a looming dark presence till the end. We see through the flashbacks as he rows up feared by all but his sister. If literature today has taught anything its that nobody is born evil, sure for some it is said that they are born to be evil but its the situations that makes it such. Parental neglect, psychiatric's obsession to emulate his own needs upon the patient and the wrong environment goes a long way in bringing them here they come on. And as Panitch skillfully peels off layers of her story as we advance in, it becomes shockingly clear just what role Lucy played in her twin brother's life and what they hid together against the world. So yes while the clues are there, the plot does succeed to shock us with its astounding revelations. Although the impact would have been much more profound if the secondary characters got the chance to shine as well but aside from that I didn't have any complaints with this book. Great start for Panitch. Damage Done provides a fresh outlook on psychological thriller and raises questions that we dare not ask ourselves. "Dark and unsettling and all the more consuming"